Bali Shangrila Beach Club is located on the beachfront at Candidasa. 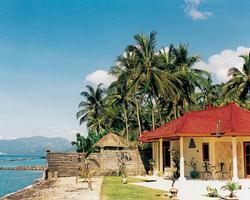 Surrounded on one side by coral-filled seas and to the rear a view of green palm covered hills and mountain terrrain. The ambience of this unique area where time is less important, is ideally located so you can discover both the friendliness and culture typical for which Bali is so famous, making this Resort one of the best places to discover the 'Real Bali'. Alternatively laze by the pool and enjoy the quite and peaceful atmosphere and the spectacular sea views and sunsets. The resort is also good for snorkling and fishing.